News from Michael Rafferty and Andrew Lebuhn at Camper & Nicholsons that they’ve taken over the listing for sale of the 48.77m motor yacht Remember When. Remember When was built by US superyacht yard Christensen to ABS class and delivered in April 2010 featuring zero speed stabilisers and a four deck elevator. MCA compliant, her contemporary interior by Carol Williamson & Associates has accommodation for 12 guests in six staterooms plus 11 crew in five cabins. The master suite is on the main deck while below a further five staterooms include a full beam VIP stateroom plus two double and two twin cabins. All staterooms have en suite facilities in marble with under floor heating. 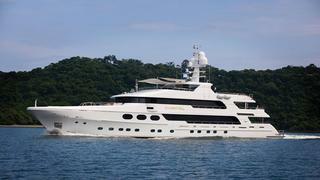 She is fully equipped with state-of-the-art technologies like WiFi internet access throughout, Crestron touch panels and satellite receivers designed to operate in the United States, Caribbean and Europe. Lightly used and immaculately kept, Remember When is powered by twin 1,770hp MTU engines, which remain under warranty until summer 2015, and reaches a maximum speed of 17 knots and a transatlantic range of 4,300 nautical miles at 11 knots. Lying in Newport, Rhode Island, Remember When is asking $29,995,000.